I’m a reader. However, I’m not a reader of the classics and this really bothers me, like a lot. I blame my high school, more specifically my English teachers, for this failure. What I remember most about English classes was sitting around, talking, and once a week taking a weekly vocabulary test. Real trying, right? I can’t really remember ever reading any books for class or having a summer reading list. Now maybe this is because I wasn’t with the cool kids in the AP English classes, but still. Okay enough with the pity party because I have decided to challenge myself! That’s right ladies and gentlemen, I am going to start reading one classic a month, I know, whoa crazy. But I feel like this is a good way to ease myself into reading books that are out of my comfort zone and y'all should help me out! Seriously, leave me a comment recommending which classic I should read next month so that I can actually start enjoying these books. I trust you. I decided to start with The Red Badge of Courage because I bought it oh, about 5 years ago (Yikes!) and it’s just been chillin’ on my shelves ever since. I have a lot of books like that; it’s just so hard because so many new amazing books come out that it’s hard to keep up. Side Note: Apparently my husband does not take any interest in the plethora of books I have around the house because when I told him how long I’ve had this book he was shocked. How does one not know what books they have in their own house?! Aaron: Oh my god Brittany! Five years? Me: Well, since Italy so maybe more. Aaron: And I bet you have a ton more just like that. Me: I mean a few, but obviously I’m reading them now, so…. So obviously my husband does not understand that some books are meant to be saved for a later date. Crikey! They’re books, they don’t go bad. Since I know y’all are dying to know what I thought of my first classic, well my first classic I consciously read because of its’ status, let me tell you: I don’t think I liked it! It’s difficult for me to say for sure that I didn’t like it because there were so many parts of the book that were incredibly profound, (ha! “insight” that’s what you get when you read classics. Apparently.) But then the parts that weren’t, were kind of boring. The premise of the book centers on a young soldier who is about to fight in his first battle shortly after he heard the call of duty (Eh? Get it? COD?) and enlisted in the military during the Civil War. What follows is an in depth look at the soldier’s inner battle with his fears that he may not be courageous enough to stand on the front lines. 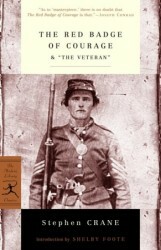 His fear is so deep that often throughout the book he longingly wishes that he’ll be maimed or killed in one of the battles, if only so that he’ll have outward proof of his courage, hence the title: the red badge of courage. The good: There were some parts of the book that I related to. For instance, I believe that the many people look at past conflicts with some disdain and with the belief that had the actions that conspired to create those wars then occurred now we, as a more intelligent and evolved society, would not have engaged the hostilities. Or at least we would have done so with more grace. Crane showed me that we are not unique in this way of thinking, for the young soldier often reflected that battles were supposed to be regarded as the “crimson blotches on the pages of the past” and only belonging to a world of “heavy crowns and high castles”; after all “men were better” now. I was floored to read my exact thoughts in the pages of a book that was written a hundred years ago on a war which I regard as one of those crimson blotches. To have that connection was amazing. Another aspect of the book that I appreciated was the short story, The Veteran, which came at the end of my copy of the book. We meet again with our young soldier, who is now quite along in his years, and we are given the opportunity to see how the war shaped his character. Best part of the whole bloody book and technically its not even part of the book, go figure. The Bad: Truthfully, so much time is spent on following the young soldier around as he walks from battle to battle that I lost interest for huge chunks of pages. And I mean huge chunks. So would I recommend the book? Well, if you’re like me and haven’t read many classics then I would pick another, because there must be better ones out there. But if you read classics like a maniac give this one a go, just be prepared to work for the truly wonderful nuggets that are hidden in all the muck. And onto the next…Started David Moody’s Hater series and it’s super good! The Count of Monte Cristo! Best. Book. Ever!